When AMS opened its new Recovery Equipment Training Facility in the UK we wondered how it would be received. And now we know… as we have received an extremely positive testimonial from Air New Zealand’s Technical Operations team. Ian Gower, On Line Maintenance Manager for Technical Operations, sent us a letter that confirmed how worthwhile our training programme proved to be. You can view the letter here. We’re very grateful for Ian’s view as it supports the preparation the AMS team has put in to ensure delegates receive industry leading aircraft recovery training while with us. 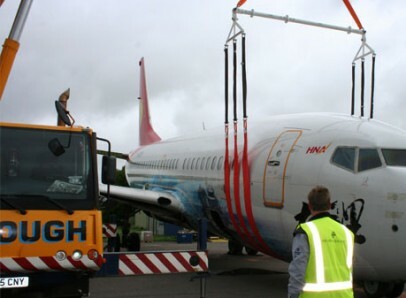 Our training facility provides the opportunity for participants to attend a training course that uses redundant B737 & A300 aircraft for a truly unique training experience that is unrivalled in the industry. The two day course covers a total of four practical exercises plus one day theory training (exercises include a complete aircraft lift on air bags, aircraft de-bogging (towing) and an aircraft fuselage lift). All recovery equipment is provided for the training, including students PPE. Basic aircraft recovery training packages are available or we can tailor the training to suit a specific organisation’s training protocol. At the end of each AMS course students are presented with a Certificate of Proficiency. The centre is also available to hire should you only wish to use AMS aircraft and equipment to conduct your own aircraft recovery training syllabus. Air New Zealand sent a team of engineers halfway round the world to be trained at our new facility and were delighted with the results. If you would like to find out why please call us on +44 (0)1420 23777, or contact us using the form on our website.